This method captures smoke produced at the surgical site through tubing held in place by an assistant. The captured smoke is then passed through a series of filters which removes the harmful elements. 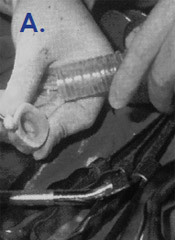 To keep the tube positioned correctly requires an assistant to maneuver the end collection tube in tandem with the surgeon. This often interferes with the line of sight of the surgeon and as a result the effort is abandoned with resultant inhalation of smoke. The ESU Suction Pencil also collects the smoke at the surgical site, using a separate shroud or tube accessory that is attached to the electrosurgical blade handle. The ESU suction pencil removes the need for an assistant but does not work with a laser or bipolar cautery and there have been concerns about the effectiveness of the end collection tubing due to its small diameter. 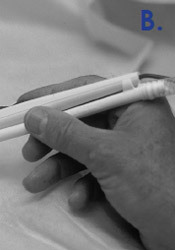 The bulky tubing handles of the ESU suction pencil causes physician hand fatigue and is hard to use. Finally, the opening of the tubing must be positioned very close to the surgical site for effective capture of smoke. If the nozzle is further than 2 inches (5cm) away from the smoke generation site, the plume is not effectively captured.